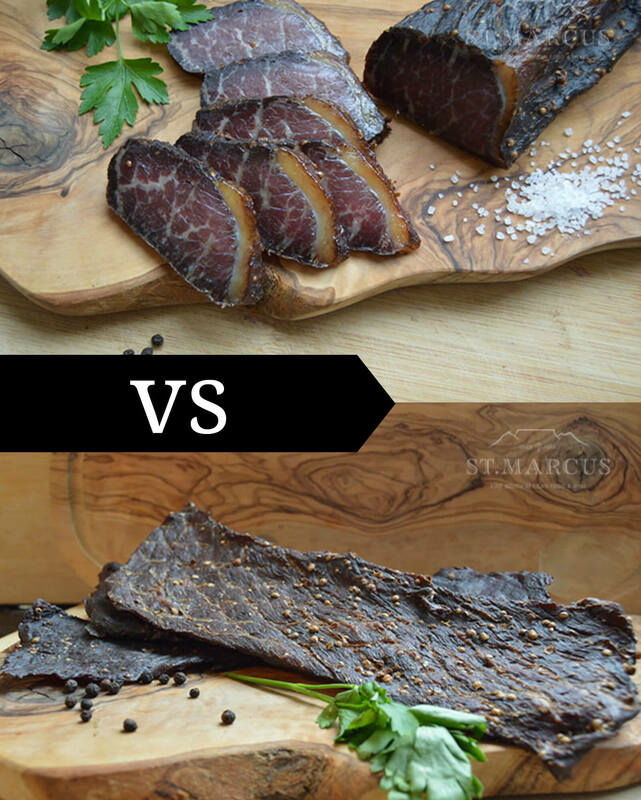 So, what’s the difference between Biltong and Jerky? Apart from the obvious cultural difference – Jerky being American and Biltong being South African – what else sets them apart? We’re going to take a look at the three main differences below. Let’s review the cut first. While Jerky’s usually very thinly cut, the South African version is far chunkier. Traditionally, biltong can vary between 4 and 6cm in thickness and could be as long as 30cm – although we tend to keep strips between 15 and 20cm and around 6 – 10cm wide. Fatty Original Biltong can also contain a strip of fat down the side and is often marbled. Although Lean Biltong would not have this, it still tends to have a bit of marbling, which is absent in Jerky. Jerky on the other hand, is a flat piece of meat that’s only about 1/2cm thick. The flats are between 3 and 5cm wide and around 20cm in length. Good quality, Grass-Fed Silverside is always used for Biltong. Traditionally flank or rump is used for Jerky, but here at St. Marcus we prepare it from the same cut as biltong. It’s worth noting that you can also use Zebra, Ostrich and Venison for Biltong and Turkey for Jerky. Next, and very importantly, is the process used to prepare Biltong and Jerky. Perhaps the main difference is in the fact that Biltong is air dried, while Jerky is cooked. This is mainly due to the absence of vinegar in Jerky. See, although the vinegar adds flavour to Biltong, it serves a greater purpose – it helps cure the meat and keep any organism away from it. Jerky, however, is first cooked in a dehydrator and then hung to cure for a while longer. This is usually the deciding factor for most people choosing between the two. Biltong is traditionally prepared with vinegar and a load of herbs and spices which provides a very full flavour. Depending on how dry you prefer your biltong, softer biltong tends to be a bit more buttery. Jerky has more of a sweet, smokey flavour. Again, it’s important to know there’s no vinegar present here, but instead, there is a bit more sugar. That’s the difference between Biltong and Jerky – or some of them at least. We’d love to know if you’ve tried both and which you prefer. Let us know by commenting below. Also feel free to add any other factors that you think separates biltong from jerky.